Learn more about the fascinating story of the flax to linen process in history, legend, song, crafts, lesson plans, and recipes. 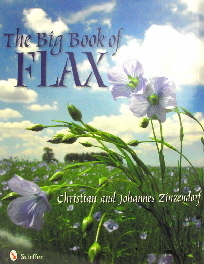 With 414 images, this comprehensive book dates back thousands of years, from how flax was cultivated in the Middle East and Europe, its beginnings in America, to its use in the twenty-first century. Guidelines for planting, harvesting, breaking, spinning, weaving, and other processes provided. If you're a collector, flax tools, spinning wheels, and flax-made antique fabrics and linen make great collectibles. Make a rope bed, a linseed oil lamp, and even bake buttermilk biscuits with flaxseed. Discover the many great uses of this plant and the role it played throughout the world. This is a great resource for history buffs, collectors, educators, and planters.